There are no major economic reports to influence GBPUSD however, USD has been supported by NFP results which came better than expected. 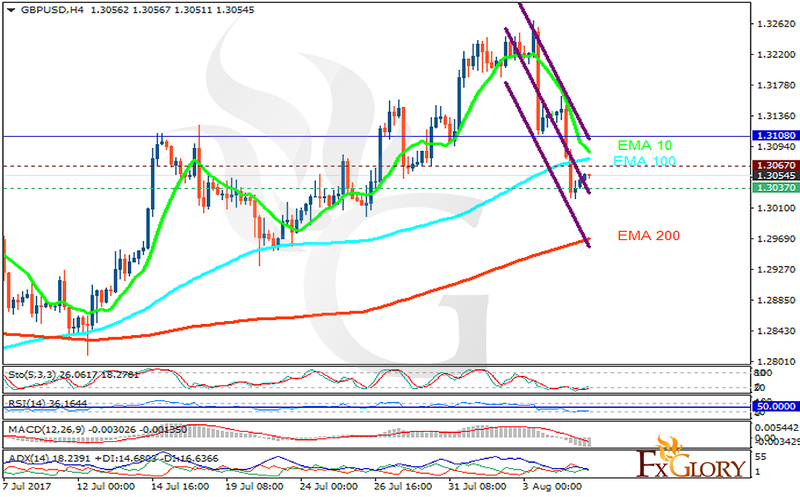 The support rests at 1.30370 with resistance at 1.30670 which both lines are below the weekly pivot point at 1.31080. The EMA of 10 is moving with bearish bias along the descendant channel but it is above the EMA of 200 and the EMA of 100. The RSI is moving horizontally in oversold area, the Stochastic is moving in low ranges and MACD indicator is in negative territory. The ADX is not showing any clear signals. Buyers can wait for the resistance level breakout and then target 1.311.